Happy Monday! I have a finished knit to share with you today. 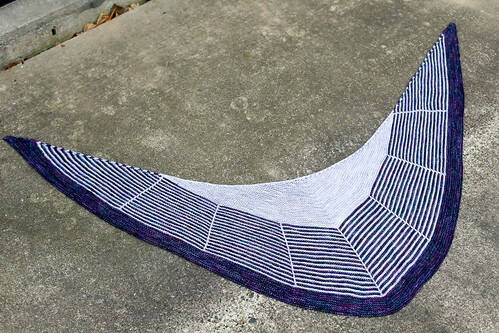 I finally snapped some photos of my Daybreak Shawl this past weekend. It was pretty cold, so I didn't get too many, but I got a few decent ones! 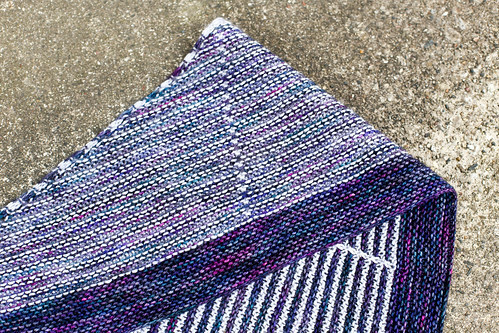 Daybreak Shawl pattern by Stephen West can be found here. 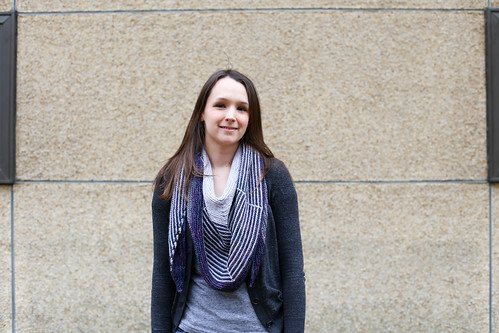 I am completely in love with how this shawl turned out, and I have been wearing it constantly. I have been wearing it wrapped around my neck like a kerchief rather than around the shoulders. There is a ton of fabric, so it's super cozy. I used Madelinetosh Pashmina in Moonstone and Cephalopod Bugga! 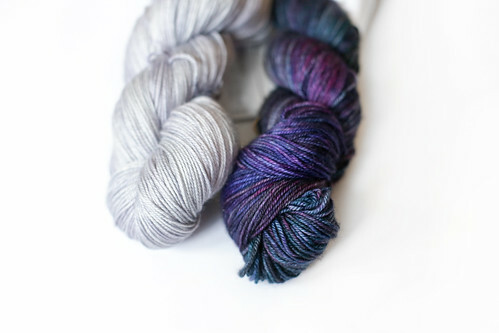 in Bold Jumping Spider (sadly discontinued) for my shawl, both in sport weight. They both have some cashmere in them, so they're super duper soft! The Bugga! has the most beautiful colors in it, it's amazing. I decided to make the medium, which has 16 stripes of each color. It was my first time knitting stripes and it was really fun! And so much easier than I thought it would be. 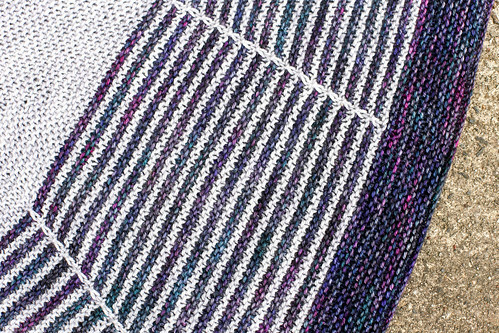 The pattern has you knit the shawl in stockinette, but Jacey and I decided to knit ours in garter after seeing this shawl on Ravelry. I'm so glad we did, I think it definitely helped improve my speed and I love the finished look! I used my blocking wires for the first time to block this shawl (along with Soak Wash of course! ), and it made such a huge difference. I'll be getting a lot of use out of them. 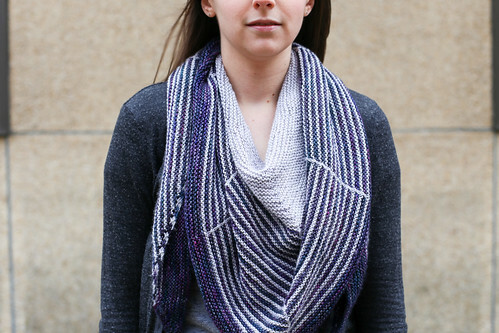 I knit this shawl as a part of the Quarter 4 challenge for the Yarnathon put on by Eat Sleep Knit! 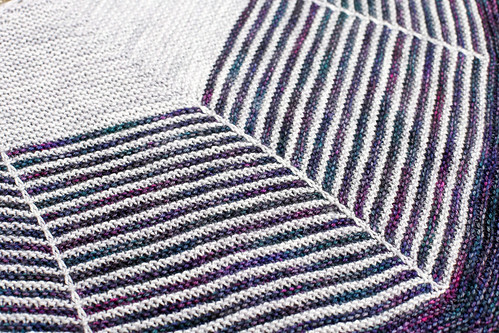 You can find more info on my shawl on my Ravelry page, here. Absolutely lovely drape on this. I really, really must strengthen my wrists so I can pick up knitting! It's beautiful work, Jeni. Completely jealous of your choices of yarn too. Your shawl looks beautiful on you!!! It is just so freaking good! The colors are stunning, and so very Jeni. I loved knitting along with you! 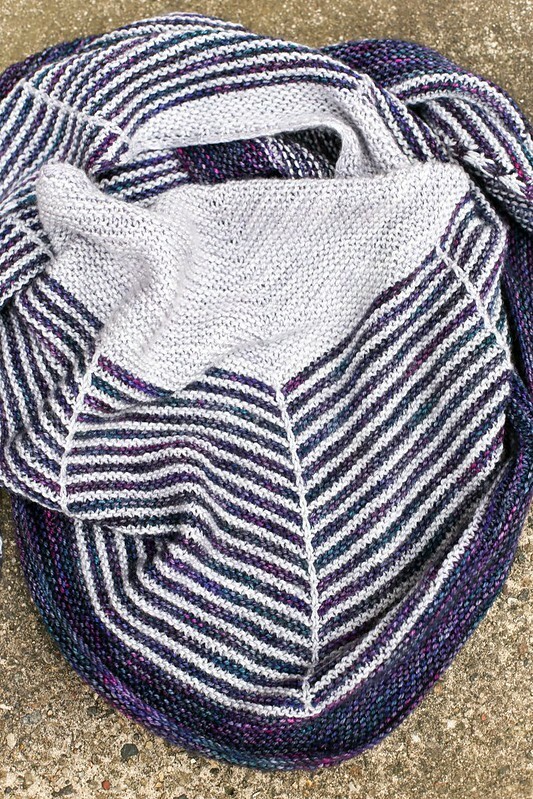 What size size circular knitting needles to use to make the shawl? It is so super amazing!!!! Thanks hun!! I used a size 7!